Cut the yellow cardstock to desired size for the front and back cover. Cut the red cover the same height, but remove about 1/2” (1.25 cm) in width. Apply Mod Podge at the back of the red cardstock and, making sure the 2 pieces are perfectly lined up on the right, press the yellow cardstock on it. This should create a red front cover with a yellow stripe at the end. Repeat the process with the other cardstock pieces, this time lining up the pieces on the left. If you haven't already done so in the past, download the Lumos font. 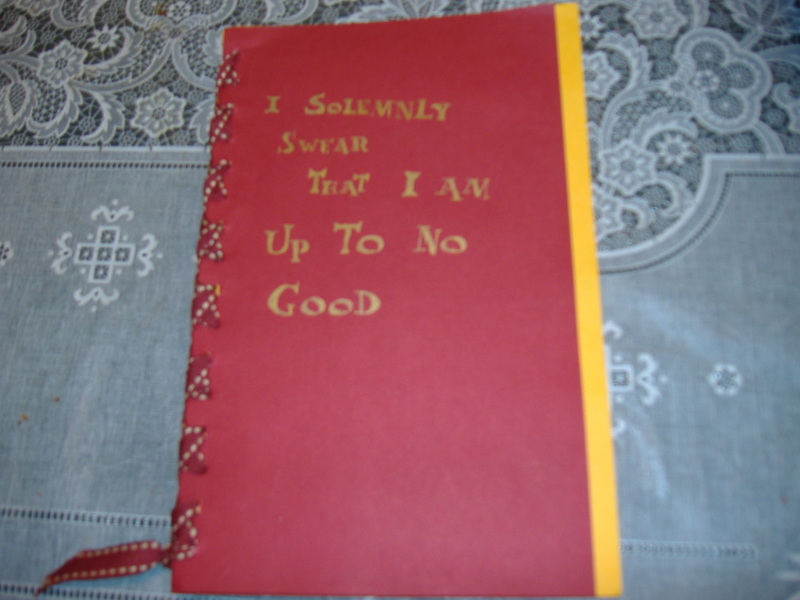 Once it's installed on your computer, open your favourite word processor software and write “I solemnly swear that I am up to no good” and “Mischief Managed”, making sure the font size and alignment look good. - Hand-draw the letters using the metallic Sharpie, reproducing the font you see on your computer. - Printing out the message on your favorite stenciling paper (parchment paper, acetate, etc. ), cutting out a stencil and then stenciling the letters onto the cardstock. Wait until the messages are completely dry, then punch holes at regular intervals in the cardstock (you may want to use a ruler and a pencil to do this). Cut journal pages from any desired paper, slightly smaller than the covers. Line the journal pages up with covers and punch holes in them as well. Insert the ribbon in the top hole and find the middle of the ribbon (hold the two ends together and pull). Lace up the whole journal with the ribbon, then tie both ends in a solid knot. Molly's tutorial was taken with permission.